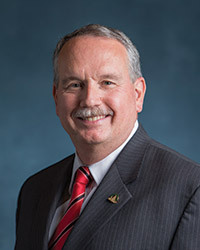 (SCHAUMBURG, Illinois)​—The American Veterinary Medical Association (AVMA) House of Delegates has elected Dr. Michael J. Topper of Harleysville, Penn., as the AVMA president-elect. Topper, the first board-certified veterinary pathologist to hold this office, will serve as a voting member of the AVMA Board of Directors. He was elected to the post during the House of Delegates’ regular annual session in San Antonio. As president-elect, Topper will assist the president in supervising all the business affairs of the AVMA. He also will serve on the AVMA Board of Governors, which acts as the executive committee of the association, and will be the presiding officer at all sessions of the House of Delegates. Topper will become AVMA president in 2017, upon expiration of the current president’s term of office. A veteran of the U.S. Army Veterinary Corps retiring at the rank of colonel, Topper is a past chair of the AVMA House Advisory Committee and previously represented Pennsylvania in the House of Delegates. He currently is director of clinical pathology for Merck Research Laboratories, and was previously director of the Division of Pathology at the Walter Reed Army Institute of Research.